You did it! $15,000 raised for new trails. And all donations were matched dollar for dollar up to $15,000 than ks to a generous local donor. Any additional funds raised going forward will be applied to the Orosco Ridge Trail Building Fund. Less than an hour from central San Diego, Pamo Valley boasts over 20,000 acres of contiguous Forest Service land that currently has little to no trails. 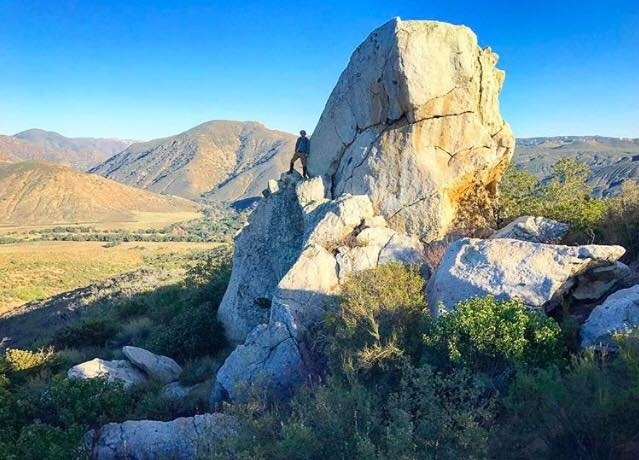 The vision for the Pamo Valley area, north of Ramona, is to create a system wide concept plan for a sustainable and connected trail system that will become a valuable asset to the region and a place for people to experience and connect to their public lands. Mountain biking continues to be a rapidly growing sport with an estimated 50,000 riders in San Diego. In addition, more people are finding hiking, trail running, backpacking and other outdoor activities a necessary release in the modern world. In a rapidly growing county like San Diego, more people are trying to use fewer trails leading to user conflict, user-created trails, environmental impacts and unsatisfied users. The need is great for a well planned and sustainable trail system in Pamo Valley so this pressure can be decreased. SDMBA, in cooperation with the Palomar District of the US Forest Service, is working to produce a concept master trails plan that will include trails for all skill levels of mountain bikers from beginner to expert and downhill and will also include many miles of multi-use trails to be enjoyed by hikers, cyclists, equestrians, trail runners and other lovers of the outdoors. There are some significant hurdles to cross before we get to any implementation phases, but we have worked with the Forest Service to identify mechanisms to assist with unbudgeted proposals in the NEPA (National Environmental Policy Act) process. SDMBA will also be signing on to assist in the building, and ongoing maintenance of these trails with our many skilled and passionate volunteers. -Staff of the Cleveland National Forest Service attended the SDMBA Advocacy meeting in November, 2016, and presented an idea for a possible trail system which might include mountain bike specific trails in Pamo Valley and Orosco Ridge area north of Ramona. -SDMBA received a Letter of Intent in February 2017, signed by Will Metz, Cleveland National Forest Supervisor of the Palomar District, to work in cooperation to develop a conceptual plan for a mountain biking specific trail network in Pamo Valley. Pamo Valley located north of Ramona is surrounded by approximately 23,000 acres of non-wilderness contiguous Forest Service ownership. -SDMBA raised over $50,000 from individual donors and a generous REI grant in the spring of 2017, to be able to hire IMBA Trail Solutions to develop a trails plan for Pamo Valley and start the building fund. IMBA Trail Solutions staff was on the ground in late May 2017 surveying the area in order to create a conceptual plan. SDMBA worked to reach out to other trail users and groups to communicate the vision for this trails plan. 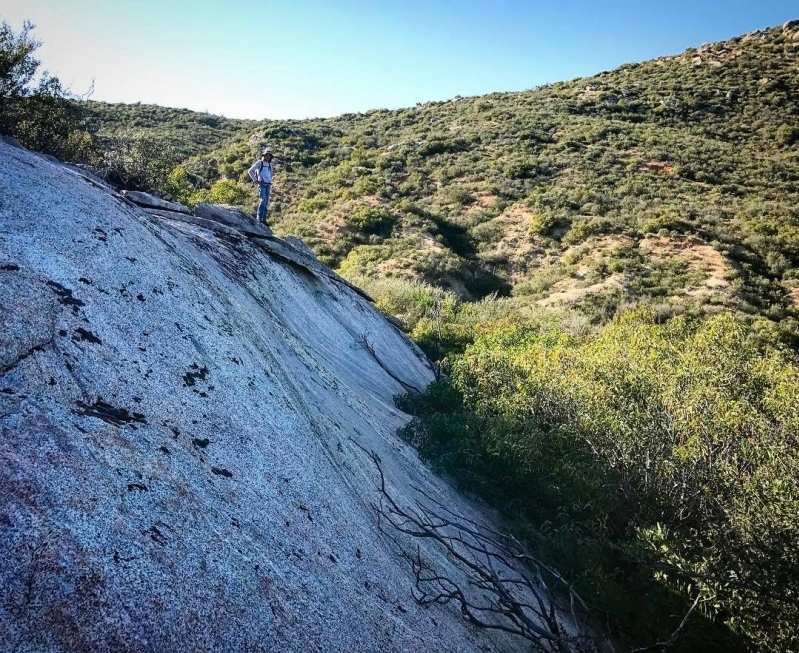 -SDMBA received a Letter of District Priority in July 2017 from the USFS, signed by Chris Dowling, Palomar District Ranger, stating that the Pamo Valley Orosco Ridge Trails planning NEPA would be included in the 2018-19 Program of Work as one of the top three overall district priorities. 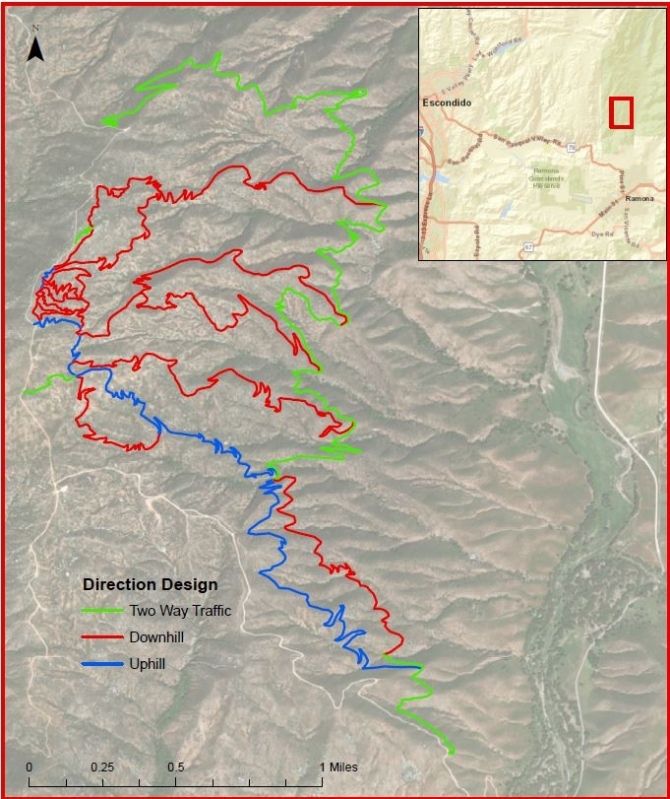 -SDMBA received a draft of the Concept Master Trails Plan from IMBA Trail Solutions in late summer of 2017. - In August of 2017, SDMBA proposed a draft plan to implement 20 miles of trails within the Orosco Ridge area to the Cleveland National Forest planning staff. 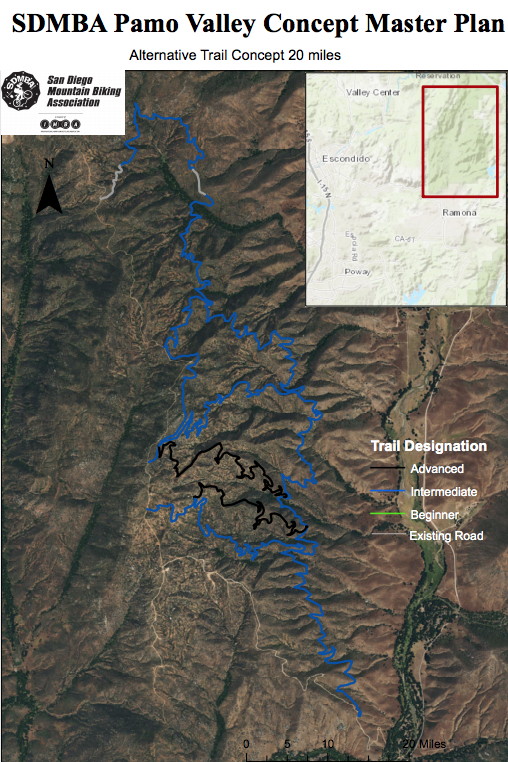 -SDMBA received Final Draft of the Pamo Valley Master Plan created by IMBA Trail Solutions. -In January 2018, SDMBA entered into a Collection Agreement with the Cleveland National Forest. This agreement to allows SDMBA to fund federal employee staff time during National Environmental Policy Act (NEPA) process and other projected costs that are not included in the Forest Service budget. These staff positions include planners, biologists, botanists, hydrologists, archaeologists, map specialists, and recreation officers. -After putting out a request for proposal (RFP) for the design of the project in late 2017, SDMBA selected Drew Perkins Trail Consulting to design the Orosco Ridge Trails Plan. Drew is best known for his work with the Mountain Bikers of Santa Cruz at the Soquel Demonstration Forest. He led the planning, design and construction of these world renowned flow trails. His portfolio also includes work and design of the Pismo Beach Preserve and the Emma McCrary Trail in Santa Cruz. Drew spent 12 days on the ground at Orosco Ridge walking the entire Orosco Ridge area in order to create a trail design plan. -April 2018 the official Scoping period opened on the Orosco Ridge Trails Plan. This comment period is 30 days long and closes on May 25th 2018. The version of the plan that is now being reviewed by Forest Service specialists is rendered below with directional orientations. -SDMBA will continue to engage any interested groups and the local and regional community regarding this plan and its implementation. SDMBA has raised an additional $15,000 so far in 2018. These funds will further the design process and further fine tune our proposal to the Forest Service. SDMBA will continue to raise funds through 2018 for the building phase through a mixture of grants, community, corporate and industry support, as the Forest Service does not have the budget for these types of proposals. -NEPA process scheduled fiscal year 2018 has already been started by Forest Service Staff. Based on NEPA findings Palomar Ranger District will be able to make a decision on moving forward with proposed trails in mid 2019. Attend monthly SDMBA advocacy meetings to stay informed of progress on this plan and other efforts around the county. Check event calendar for details. Become a member of SDMBA. Join here. Donate HERE to the Orosco Ridge Trails Building Fund. * All donations are tax deductible to the extent allowed by law. Of the funds collected for the Orosco Ridge Trails Building Fund, no more than 10% of donations will go directly to SDMBA operational costs. Money donated to this plan will go towards design, plan management, trail building and paying for Forest Service Staff or an outside consultant to provide needed resource studies for the NEPA process to be complete. All funds that pay for Forest Service Staff time will be used directly for this plan only. Resource study costs are not within the current budget of the Cleveland National Forest, but the Forest Service is supplying in kind contributions of other staff time within the District to complete the NEPA process. Checks made out to SDMBA are graciously accepted at PO Box 881491, San Diego, CA 92168. Please note that your donation is for the Pamo Valley Trail Building Fund.